The atomic nucleus is a quantum mechanical ensemble of nucleons (protons, neutrons). Its properties are determined by 'fundamental' interactions, as nucleon - nucleon interaction, Coulomb interaction, spin - orbit interaction etc. In this case understanding the structure of nuclei is essential for understanding the 'fundamental' interactions. Superheavy nuclei (SHE) represent ensembles of 'extremely' large numbers of protons and neutrons and are thus ideal test cases for 'fundamental' interactions under extreme conditions. 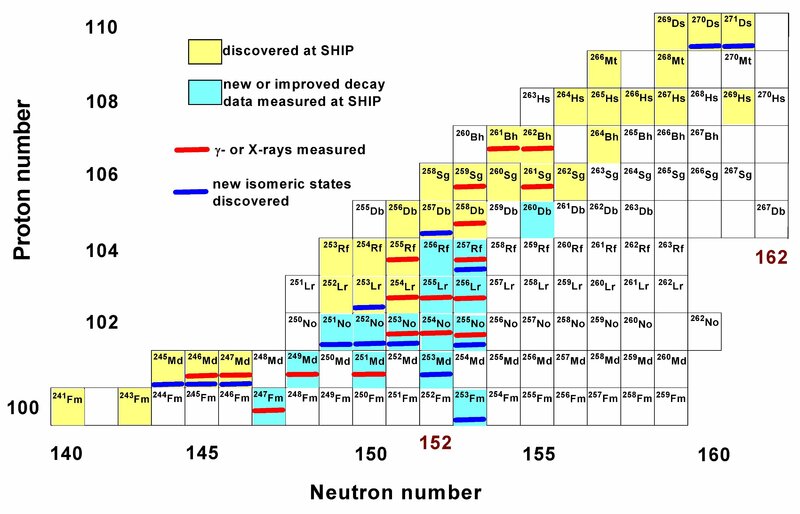 At SHIP about a decade ago an experimental program had been started to investigate nuclear structure of isotopes in the element range Z ≥ 100 by means of α - γ - decay spectroscopy. Of special interest is the region of strongly deformed nuclei around Z = 102, N = 152. These isotopes have a special stability due to large energy gaps between certain proton and neutron energy levels. The stability is reflected by isomeric states in many of these isotopes. Nuclei in this region can still be produced in a sufficient amount which enables an accurate study of the energies and ordering of the proton and neutron levels. From these results valuable insights can be obtained on shell gaps in the region of predicted spherical SHE which is expected around Z = 114, 120 or 126 and N = 184 and cannot yet be investigated directly. An overview of isotopes that have been investigated at SHIP within the last decade is given in fig. 1. Present techniques allow for detailed nuclear structure investigations up to isotopes with production cross sections down to 10 pb in reasonable experiment times, which means up to isotopes 270,271Ds (Z = 110). Technical and experimental improvements, which are in progress or considered in next future will pin down the cross section limit to approximately 1 pb. Then, nuclear structure investigations of superheavy element up to Z = 118 will be in reach. Systematic study of low lying Nilsson levels in odd mass einsteinium isotopes by α-γ-coincidence studies of the corresponding mendelevium mother nuclei.